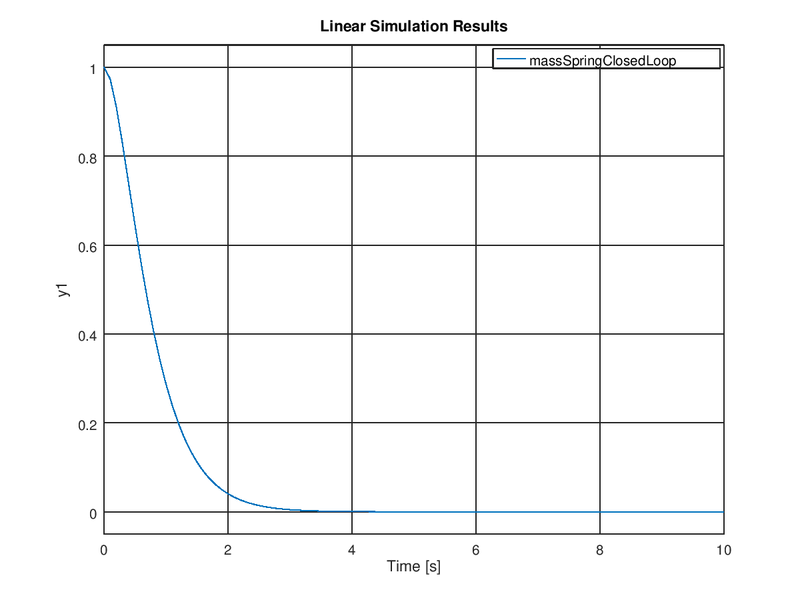 In Part 4, I covered how to make a state-space model of a system to make running simulations easy. In this post, I'll talk about how to use that model to make a controller for our system. Where \(p\) is position, \(k\) is the spring constant of the spring (how strong it is), and \(m\) is the mass of the cart. You can derive this from Hooke's Law if you're interested, but the intuitive explanation is that the spring pulls back against the cart proportionally to how far it is away from the equilibrium state of the spring, but gets slowed down the heavier the cart is. Where \(c\) is the "damping coefficient" - essentially the amount of friction acting on the cart. Now that we have this equation, let's convert it into state space form! 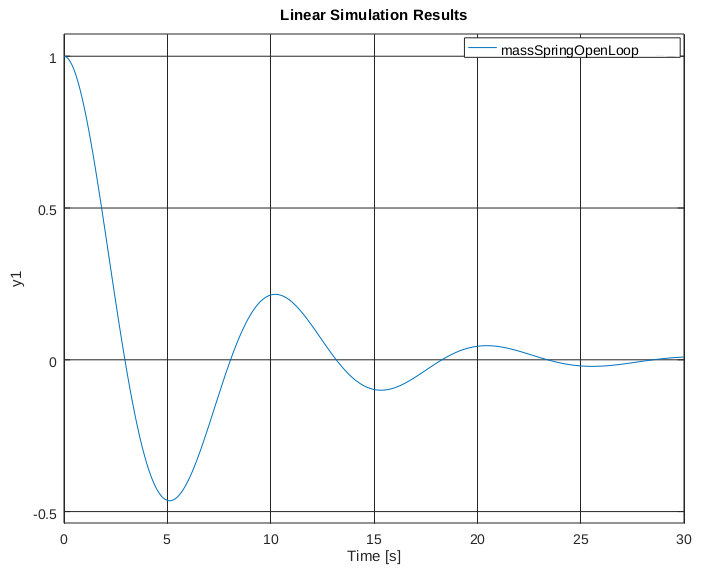 Notice that this plot shows two things happening - the position is oscillating, but also decreasing. There's actually a way to quantify how much the system will oscillate and how quickly it will converge to zero (if it does at all!). In order to see how a system will act, we look at the "poles" of the system. In order to understand what the poles of a system mean, we need to take a quick detour into linear algebra. The vectors that don't change direction when transformed are called "eigenvectors". For this transform, the eigenvectors are the blue and pink arrows. Each eigenvector has an "eigenvalue", which is how much it stretches the vector by. In this example, the eigenvalue of the blue vectors is 3 and the eigenvalue of the pink vectors is 1. So we can see that we have two eigenvalues, both of which are complex numbers. What does this mean? Well, the real component of the number tells you how fast the system will converge to zero. The more negative it is, the faster it will converge to zero. If it is above zero, the system is unstable, and will trend towards infinity (or negative infinity). If it is exactly zero, the system is "marginally stable" - it won't get larger or smaller. The imaginary part of the number tells you how much the system will oscillate. For every positive imaginary part, there is a negative one of the same magnitude with the same real part, so it's just the magnitude of the imaginary part that determines how much the system will oscillate - the higher the magnitude of the imaginary part, the more the system will oscillate. Why is this the case? Well, as it turns out, the derivative of a specific state is the current value of that state times the eigenvalue associated with that state. So, a negative eigenvalue will result in a derivative that drives the state to zero, whereas a positive eigenvalue will cause the state to increase in magnitude forever. A eigenvalue of zero will cause the derivative to be zero, which obviously results in no change to the state. The blue vector is the position of the system. The red vectors are the different components of that position (the sum of the red vectors will equal the blue vector). The green vectors are the time derivatives of the red vectors. As you can see, the eigenvalue being imaginary causes each component of the position to be imaginary, but since there is always a pair of imaginary poles of the same magnitude but different signs, the actual position will always be real. Much better! It converges in under five seconds with no oscillation, compared with >30 seconds with lots of oscillations for the open-loop response. But wait, if we can place the poles anywhere we want, and the more negative they are the faster the response, why not just place them as far negative as possible? Why not place them at -100 or -1000 or -100000? For that matter, why do we ever want our system to oscillate, if we can just make the imaginary part of the poles zero? Well, the answer is that you can make the system converge as fast as you want, so long as you have enough energy that you can actually apply to the system. In real life, the motors and actuators that are limited in the amount of force that they can apply. We ignore this in the state-space model, since it makes the system non-linear, but it's something that you need to keep in mind when designing a controller. This is also the reason that you might want some oscillation - oscillation will make you reach your target faster than you would otherwise. Sometimes, getting to the target fast is more important than not oscillating much. So, that's how you design a state space controller with pole placement! There are also a ton of other ways to design controllers (most notably LQR) which I'll go into later, but understanding how poles determine the response of a system is important for any kind of controller.